Richard Strauss is my third favourite composer at the moment. One of my favourites works of his is the tone poem Don Quixote. In fact I think it's perfect and probably his best work. The Four Last Songs aren't that bad either. I'd be really interested to know what others think of his works? Perhaps you could list works of Strauss that you like or dislike and then why? I have just ordered the Brilliant Classics set with Staatskapelle Dresden and Rudolf Kempe, and i look forward to hearing that. My interest in Richard Strauss has increased over the years. I am very fond of Till Eulenspiegel and Ein Alpensinfonie. I have tried a couple of his operas too, did not care too much about them. But perhaps i need to hear them a few times before i appreciate them, they aren't exactly easy listening. I may give them another try. Intergamer wrote: Richard Strauss is my third favourite composer at the moment. It was the all-knowing, all-seeing, late, great pianist Gleen Gould who wrote that R Strauus is the greatest musician of the 20th Century. Don't let the phlisitines tell you differently. Can someone please tell me why Ein Alpensinfonie is considered such a bad work? People like George Solti, have said that they can't understand why a composer at the height of his powers, could write such a poor work. I personally can't find anything wrong with it. Intergamer wrote: Can someone please tell me why Ein Alpensinfonie is considered such a bad work? The negative clichés used to denigrate some of Strauss's works are quite persistant. They appear to have been passed on with the language virtually unchanged over the years which indicates to me that they are just phrases heard or read and repeated without any real consideration. I think Ein Alpensinfonie and Symphonia Domestica are wonderful by the way. Surprising---coming from Gould, the spiritual Bach-performer. At least one musicologist has noted that of all the "great" masters, Strauss' music possesses the least degree of "spirituality". For all his melodic and harmonic wealth, his rhythmic vitality and unbeatable orchestral palate, his style is remarkably materialistic. But I love his works. I learned "Till Eulenspiegel" at age three, wore out the record so that my mother had to replace it by the time I was five. Remember, too---when Strauss was asked later in life to name one of the greatest influences on his development as composer, he replied "the symphonies of Raff"! johnshade wrote: Gleen Gould who wrote that R Strauss is the greatest musician of the 20th Century. Gould often played transcriptions from Strauss operas for his own enjoyment and also recored some of Strauss early piano works. As a young man Gould said he went through his "Heldenleben" period. He was serious about Strauss. If you can stand opera, try Der Rosenkavalier. It is a remarkable work with a great librettist. I don't see that Alpensinfonie is a bad work. Perhaps it isn't one of his most inspired pieces. I have often thought that Strauss was one of the most non-Christian of all composers. There is a kind of post-Christian spirituality in his work though. Up until 1750 Western music was predominantly Christian in nature. Even after that date a waning faith still exercised a profound influence on music. Salome illustrates what I mean about Strauss. John the Baptist comes across as a rather boring deadhead, while Salome thrills us with her necrophiliac ecstasy. Perhaps Strauss renounced the Christian tradition in favor of a worship of life and Eros. I have trouble with Strauss. I find his works completely overwhelming, and I want to go crazy listening to them. I have only listened to his most famous pieces, so I'm referring to things like Zarathustra, Till Eulenspiegel, Don Quixote, Der Rosenkavalier, etc. I think with Reiner conducting, it makes his music just over the top and unbearable. I respect the composer in terms of technique and ability because his craft is too strong to insult. I would never insist he's "bad" but rather that he was too good at what he was trying to do which evidently is tear my nerves apart one by one. Salome makes more sense to me since the music matches the libretto. What I would like is to hear some music by him with a bit more repose. What are examples of Strauss works that are more calm? I haven't heard enough. Try his wind ensemble works and the Oboe Concerto. They're full of charm. I suggest a 2 CD Virgin set of Strauss works, which was one of the best issues I came across in 2006. CD 1 contains 9 Songs with Orchestra and the Metamorphosen for 23 solo strings (1945) performed by the Academy of London, Richard Stamp conducting. Gundula Janowitz sings the songs. CD 2 features the Oboe Concerto with the same forces, with oboist Ray Still, formerly of the Chicago Symphony, and the Sonata for violin and piano in E Flat Major, Op. 18 performed by Dmitry Sitkovetsky, violin, and Pavel Gililov, piano. Virgin 5 61766 2. These are fine works performed superbly by all concerned. And, certainly not frenetic or over the top. Gee--I haven't had a "Strauss-high" like that in almost fifty years. But give yourself some time with the tone-poems, get good recordings of them (Böhm is EXCELLENT, never over the top) because eventually they'll stop driving you mad. Do Liszt's "Mazeppa", "Tasso" and "Les Prèludes" do that for you too? Thanks for the listening recommendations everyone! I want to broaden my understanding of Strauss. Jack Kelso wrote: Do Liszt's "Mazeppa", "Tasso" and "Les Prèludes" do that for you too? No, not at all. I love his tone poems and especially Mazeppa is so charming. Maybe the heavy orchestration of Strauss is too much for me. I think Mahler can be clunky too for the same reason, but his music is so tender at times that it balances it out. greymouse wrote: I think with Reiner conducting, it makes his music just over the top and unbearable. Reiner was the greatest of all Strauss conductors...he gets the energy, the sonority and the clarity [big problem with Strauss] just right. He made great Strauss recordings with not only the CSO, but the VPO, MetOpera [RCA VictorSO] and PittsburghSO as well. these are classics..
his CSO Don Juan II  and Till Eulenspiegel [VPO '56] were both done on one take, IIRC !! greymouse wrote: Maybe the heavy orchestration of Strauss is too much for me. I disagree. Just to take three examples. What makes the operas, Salome, Elektra, and Die Frau ohne Schatten so wonderful is the orchestration of these works by the master of orchestration, R Strauss. Didn´t Richard Strauss consider himself "a second rate composer, but a first rate second rate composer" ? I have always loved his work, listening to his own recordings as well as recordings conducted by Reiner (both Pittsburgh and CSO) , Karajan, Böhm , Krauss, Ackerman, Szell and Erich Kleiber. And Furtwangler and Beecham and many more. His Last Four Songs is one of the most moving pieces i have ever heard. Don Quijote is my favorite among his tone poems. And I like the Alp Symphony too. Strauss is one of the most innovative and brilliant orchestrators ever, ranking alongside Ravel, Mahler, Tchaikovsky, Stravinsky, Wagner and Berlioz (in fact, Strauss edited/authored a new edition of Berlioz's treatise on orchestration in 1905, which remains definitive today). In addition to his operas and tone poems, he composed brilliant concertos for both horn (2 horn concerti) and piano (his Burleske in d minor -- a masterpiece). (He also composed a VC and oboe concerto -- neither of which I have much familiarity). His primary shortcoming is the lack of solo/chamber music . . . . . . .
One of my favorite composers. Brahms wrote: His primary shortcoming is the lack of solo/chamber music . . . . . . .
...and a deeper spirituality, perhaps also that certain vulnerability---if you will. This is what Handel, Bach, Haydn, Mozart, Beethoven, Schumann, Bruckner, etc. possessed in great wealth---but of which I hear little in Strauss. Still---I can listen to him with great wonder and admiration, enjoying the outward passion, lust, drama and playfulness that fill his best work. What: Rosenkavalier Why: the Marschallin and terrific music with savvy instrumentation. The orchestral score rewards close study. To me, Richard Strauss is, with Mahler and Hugo Wolf one of the three greatest composers of the generation that followed Wagner, Brahms and Bruckner. I feel that his music is always turned to the opera, even in his tone poems. I love Salome, Elektra, Daphne, Arabella, Capriccio and the Lieder, but also Don Juan, Don Quixotte, Metamorfosen, the Oboe Concerto. A music turned to pure beauty, to the colour, the perfect use of the human voice - even the cello in Don Quixotte seems to sing - but also human. Capriccio, for example, composed during the II WW, in the most barbaric phase of the nazism is not superficial: what better reply to the nazis that a glorification of the French civilization in a time when Paris was under the brutality of the Wehrmacht? AntonioA wrote: Didn´t Richard Strauss consider himself "a second rate composer, but a first rate second rate composer" ? Yes, he said this in rehearsals in England when he was in his 80s. He said it in jest, but he considered Mozart, Beethoven, and Wagner as first-rate composers. Re: His spirituality. He was not a religious man and found it difficult to write music for Biblical heros such as John the Baptist and Joseph. I believe that his spirituality comes from the music of his idols Mozart and Wagner. As far as anyone knows he was a moral person and much more generous of his time, energy, and money than he is given credit for. Intergamer wrote: The Four Last Songs aren't that bad either. Lol...probably the most extravagantly beautiful vocal music I can think of right now. But you're right, they're not that bad. Of Strauss' work, Vier letzte Lieder and Metamorphosen are among my favorites, and I also admit to being a big fan of Eine Alpensinfonie. I find his work to be a bit uneven, though, and some of his tone poems don't do much for me. Oddly enough, I came across the most interesting aspects of Strauss' life while reading books in one of my primary fields of interest, WWII/European history. His entanglements with the Nazi regime where fantastically more complex than one is usually exposed to, if they are at all. To call it a Faustian bargain is only slightly reaching the core. The hearbreaking seesaw of a man whose close friends where being increasingly 'marginalized' and his ability to just kind of 'live with it' is overwhelming. One author(I wish I could recall the exact volume) painted a portrait of a man who was very aware of his own titanic abilities yet very insecure about his forever being in the immediate shadows of giants. You get the impression of Strauss being saddled with a pre-Wagner ego in a post-Wagner world. I'm looking forward to digging even deeper into this fascinating composer's life...dare I say, ein heldenleben. val wrote: To me, Richard Strauss is, with Mahler and Hugo Wolf one of the three greatest composers of the generation that followed Wagner, Brahms and Bruckner. Whaaat are you saying, Val? Hugo Wolf----greater than Elgar, Sinding, Debussy, Delius, Nielsen and Sibelius...?! johnshade wrote: Re: His spirituality. He was not a religious man and found it difficult to write music for Biblical heros such as John the Baptist and Joseph. I believe that his spirituality comes from the music of his idols Mozart and Wagner. As far as anyone knows he was a moral person and much more generous of his time, energy, and money than he is given credit for. Actually, I wasn't referring to his character. There's a certain worldly materialism that comes through in his orchestral works, perhaps a lack of pensive modesty. It's hard to express "what I don't hear or feel" in this man's very attractive and voluptuous style. In this sense, he's the opposite of Beethoven and Schumann. What you hear is what's there. That's it. Of course not. In special Debussy, one of my favorite composers. I was referring to the german world, Germany and Austria. And, although there are in that generation several good composers, like Reger, I think that Strauss, Mahler and Wolf were the greatest between the generation of Wagner, Bruckner and Brahms and the generation of Schönberg, Hindemith, Webern. By the way Jack: Hugo Wolf is a great musician. It is a pity that his Lieder (in special those he composed on Möricke poems, or the Spanish Liederbuch) are not as famous as they deserved.. I highly respect your opinion. Not all of his music is inspired. His own wife accused him of "note spinning". To me, however, there are certain scenes especially in his operas that bring me unnameable delight and create the the spirituality that you find lacking. Perhaps some of the operas contain that "certain spirituality", which could also be defined as a "struggle from within". "Your son's wonderful sonata ... is indeed a splendid work. ... Your son is fundamentally wholesome by nature, and I hope it will be al long day before he is sicklied o're with the pale cast of thought. I rejoice from the bottom of my heart and take greatest pleasue in your son's success." 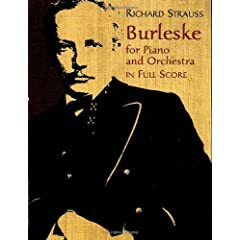 This is an example of the success of Strauss's early works and may shed some light on why Richard Strauss was "blessed/cursed with a supreme confidence". There was nothing especially traumatic in Strauss's life except his witnessing of the Nazi destruction of German culture during WW II. His Metamorphosen for 23 solo strings (1945) was his reaction to this destruction. This work certainly shows a "struggle from within." I have just ordered this book from Amazon: Richard Strauss's Orchestral Music and the German Intellectual Tradition The Amazon review states the book breaks new ground in Straussian studies. Youmans (Assistant Professor of Musicology at Penn State University) provides a provocative investigation of Strauss's private intellectual life and its impact on the brilliant music he created during the formation of his worldview. The composer's works have traditionally been viewed as a product of high German Romanticism, yet Youmans demonstrates that Strauss's entire body of orchestral music can be read as a history of his struggle with specific intellectual-historical concerns. Exploring the significant influences of Schopenhauer, Nietzsche, Goethe, and Wagner on the young composer, Youmans insightfully establishes that the cultural convictions and preconceptions which grounded the composer's artistic choices in fact provided him with the philosophical and musical materials that formed the basis of an early modernism. Through this grounding, the mature Strauss succeeded in opening up a new aesthetic frontier devoted to! optimism, physicality, and the visual. Intergamer wrote: Richard Strauss is my third favourite composer at the moment. One of my favourites works of his is the tone poem Don Quixote. In fact I think it's perfect and probably his best work. The Four Last Songs aren't that bad either. Don Quixote remains a quest. I am currently tinkering with the Isserlis/Maazel. Four Last Songs I rotate amongst four or five singers. Voices change depending on my mood. Ein Heldenleben. Recording after recording conductors were going for the fence with every pitch. Phrasings, movements, became horribly disjointed. Cleveland Orchestra with then young conductor Ashkenazy hit the homerun with finesse, not power. Sometimes one does not see or hear the forest for the trees. That describes my long journey to Kempe for Symphonia Domestica and Le bourgeois gentilhomme (suite). Other examples where finesse matters. Strauss is right up there with my favorites: Mahler, Wagner, Puccini, and Bruckner. Why Strauss? Der Rosenkavalier has some of the most ethereal music ever written, as well as an all-encompassing Weltanschauung, and the "presentation of the rose" scene is the best musical equivalent to Shakespeare's Romeo and Juliet's love at first sight recognition, "Oh, she doth teach the torches to burn bright!" Also, there's absolutely nothing wrong with the Alpine Symphony. "Oh, you wretched mortals--open your eyes--and ears!" John Haueisen wrote: Strauss is right up there with my favorites: Mahler, Wagner, Puccini, and Bruckner. Considering that company, there would be something wrong if Strauss were NOT included! You would probably also enjoy Felix Draeseke, a fine Wagnerian symphonist. Thanks for letting us know about Draeseke. To tell you the truth I have never heard of him and I though I knew German music of this era well. Same goes for me--thanks for the suggestion.